The Duke and Duchess of Rothesay have officially opened Glasgow tea rooms based on original designs by Charles Rennie Mackintosh. Charles and Camilla visited Mackintosh at the Willow on Sauchiehall Street. They also put in place a wood carving, to complete the £10m four-year restoration project. It is based on the only example where Mackintosh had complete control of architecture, interior design, furniture and even cutlery. The royal couple toured the restored saloons, billiard room, gallery and salon de luxe, as well as a new exhibition telling the story of Mackintosh and Miss Catherine Cranston, who commissioned the tea rooms and restaurant. They also met trainees who had been taken on by the tea room following a training course organised through the Prince's Trust. 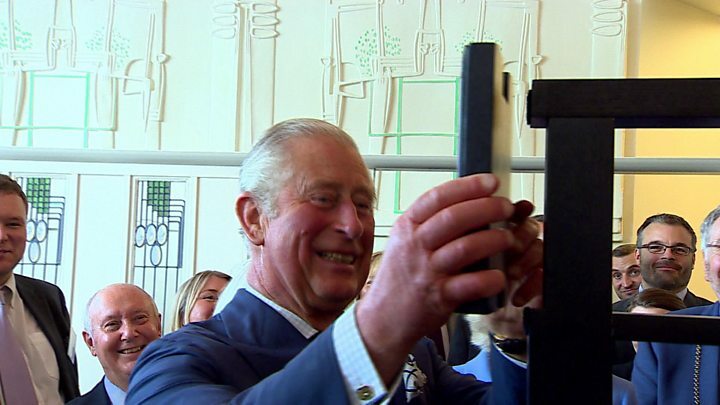 Prince Charles told them: "I wish you nothing but the greatest success from now on and I'm very proud to have played a small part in opening the tea rooms." They then greeted crowds in Sauchiehall Street as they left. The Duchess is due to visit the Beatson West of Scotland Cancer Centre to hear about the work of Target Ovarian Cancer in its 10th anniversary year, before heading to the Maggie's Centre at Gartnavel Hospital. The Duchess has been president of Maggie's Centres since 2008 and will meet Lily Jencks, daughter of the charity's co-founders, who designed the garden surrounding the centre.